When building an effective team, social interactions are a key tool used by facilitators to bond the team members together. Games make social interactions easier because they provide a structure in which the team members interact. Another benefit in the structure is that it involves all of the team members – even the shy ones. In addition, regular use of team building games will make the team development process faster because of the amount of interactions that will occur while the members are having fun playing games. So just what are social interactions? Social interaction is a dynamic, changing sequence of social actions between individuals (or groups) who modify their actions and reactions according to those of their interaction partner(s). In other words, they are events in which people attach meaning to a situation, interpret what others are meaning, and respond accordingly. Social interactions can be differentiated into:…Regulated – planned and regulated by customs or law, will definitely raise questions when missed. Interaction in a workplace (coming to work, staff meetings, playing a game, etc. ), family, etc. In sociological hierarchy, social interaction is more advanced than behaviour, action, social behaviour, social action and social contact, and is in turn followed by more advanced concept of social relation. In other words, social interactions, which consist of social actions, form the basis for social relations. The most common social action is talking. This involves skills in: oral language, conversation, listening, etiquette, manners, body language, interpreting tonal inflections, questioning, honesty and eventually trust. Other social actions include: making friends, meeting people, hosting, commercial transactions, playing sports, being a member of a club etc. Another advantage of using team building games to teach social interaction skills has to do with our age of digital communication. With the ubiquitous use of social media, texting, instant messaging and email these days, skills in face-to-face communication and social interactions are becoming less well developed then when communication was mainly done in person. These face-to-face skills are the very ones required in team work. 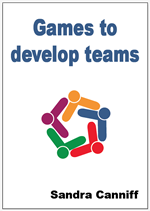 They are also the very ones being developed through the use of team building games. getting to know something about you. Knowing which type of icebreaker you need will help you to select more appropriately. This is the type of icebreaker that is often deemed to be synonymous with the term ‘icebreaker’. It is needed when the team is first forming. It is most important to use when the participants are strangers. But also important when team members have not interacted regularly before the team formed. In all social interactions when two strangers meet, the first thing they do is introduce themselves. This icebreaker provides a structure for those introductions to be accomplished quickly in larger groups. And sometimes there is some fun added. It is important as a first step for everyone to know the names of their team mates. The ‘Getting to know your name’ icebreaker is the most non-threatening of the three types. Because this is most renowned form of icebreaker, many facilitators only use one icebreaker with a team or group. But just like in a social gathering when meeting a stranger the conversation then develops in stages, so icebreakers come in stages also. So you can use as many icebreakers as you feel are necessary to break down the normal personal barriers that exist when people are thrown together with strangers and/or casual acquaintances. The ‘Getting to talk to you’ icebreakers mimic the next step in meeting someone – talking to them. In a social gathering strangers often talk about the weather – a topic which has few emotional ties. You can spin this topic for quite awhile without investing anything of yourself into it. So it is a comfortable topic. These icebreakers are a structured way of having a light or ‘comfortable’ conversation. They ask the participants to talk about anything except themselves. They are providing social interactions that are starting to build tenuous links between team members. They can be confused with entry level team bonding games. But in these games, emotional investment is very low. Thus the ‘Getting to talk to you’ icebreakers are low threat. These icebreakers are seeking to provide a structure for everyone to talk about themselves. This is the next level of normal conversation. Even though this is an easy topic for most of us, it incurs a slightly higher threat level than the other two types of icebreakers. There is now some emotional attachment to the content. Thus, it is usually used after the other two types. Sometimes, the ‘getting to know your name’ icebreakers will also include some personal things. But generally they are there to provide a context for the name. In the ‘Getting to know something about you’ games, the structured activity is providing a fun way to explore like and dislikes, values and skills. The links between members are growing very slightly stronger. Since conversation is involved in these quick activities, many of these games are done in smaller sub groups. Thus, tenuous links are not forming between members of the entire team, but with some members within the team. For that reason, there may need to be a few of these type of icebreakers used to start the team bonding process. The facilitator will feel the difference between working with quiet strangers and working with a team that freely talks with each other. At that point, icebreakers are no longer needed. Energisers and team bonding games take over. Team building is seen as a serious endeavour. So why would you want to add games and fun to this environment? According to Maarten van Aalst, the director of the Red Cross/Red Crescent Climate Centre, “Games are an excellent means to get through often complex messages of scientists and can help bring about real change”. When playing games, the participants are learning. This site is dedicated to the thought that something as simple as fun is the easiest way to change people’s behaviour for the better. Be it for yourself, for the environment, or for something entirely different, the only thing that matters is that it’s change for the better. In the video below, a research team decided to use fun as a means of increasing the use of the recycling bin on the street. Games add an element of fun to your team building program. Through this fun, you can lighten the serious mood and re-engage the participants with the subject matter. In addition games help the team members to both create and strengthen social ties with their fellow team members. This is turn helps to unite them in their learning. Here is another way that a fun theory team found to alter human behaviour. This is a new way to do an old behaviour. Putting rubbish in the bin has not always been top priority for everyone. But add a bit of fun and it can become so. the participation level of team members. There are many reasons for using games in your team building program. The most important reason for most facilitators is that games can add an element of fun. In the other training activities, fun may not be the foremost goal. Games can entice team members to become involved. Team members will interact with each other in a different type of activity from the rest of the training program. Thus, games bring them together in a new situation. While participating, they get to know another side to their team mates. Some of the other reasons are listed below. Participating in games provides team members with an opportunity for movement that can be sadly lacking in the daily training/school routine. Physical activity/movement promotes an increase in brain activity and re-energises the body. Both increased brain, muscle activity lead to increased blood flow that will both refocus attention and improve the individual’s mood. Any change in activity level will refresh participants and offset boredom. This is often called a brain break. There is some evidence that goes further to say that if the games require movement that encourage participants to be active they can improve learning, concentration and memory. Interactive games build relationships between team members. In the developing of relationships, team members can get to know one another and start to trust one another while having fun. Games can be educative in subtle but effective ways. All games can help develop a range of communication skills and some require use of literacy and numeracy skills. reflective, evaluative and critical thinking (closure games). The connection between the student’s ability to learn and their physical activity has been known for decades. But the implementation of the practice of physical activity during learning has not been consistently practised. The use of games in your team building program can add the physical activity that according to these reports will improve the learning that will occur. There are many articles in this area but I am confining my references to three of the latest reports. They are all from the U.S.A. and have been published in the last three years. The most recent report was published in May of this year by the Institute of Medicine of the National Academies. Children who are more active show greater attention, have faster cognitive processing speed, and perform better on standardized academic tests than children who are less active… [They went on to add] In addition, students should engage in vigorous or moderate-intensity physical activity throughout the school day, such as through recess and classroom time dedicated to physical activity. When learners are asked to stay sedentary for long periods of time they lose focus and and find it hard to concentrate. They may even become bored. But with a short break for some physical activity, they become energised and more attentive. Nine studies (reported in nine articles) explored physical activity that occurred in classrooms apart from physical education classes and recess. In general, these studies explored short physical activity breaks (5–20 minutes) or ways to introduce physical activity into learning activities that were either designed to promote learning through physical activity or provide students with a pure physical activity break. These studies examined how the introduction of brief physical activities in a classroom setting affected cognitive skills (aptitude, attention, memory) and attitudes (mood); academic behaviors (on-task behavior, concentration); and academic achievement (standardized test scores, reading literacy scores, or math fluency scores). Eight of the nine studies found positive associations between classroom-based physical activity and indicators of cognitive skills and attitudes, academic behavior, and academic achievement; none of the studies found negative associations. When using games in team building programs, they are generally 5-20 minutes in length. Thus, they should have a similar impact with corresponding learning improvements. • Four out of five principals report that recess has a positive impact on academic achievement. • Two-thirds of principals report that students listen better after recess and are more focused in class. • Virtually all believe that recess has a positive impact on children’s social development (96 percent) and general well-being (97 percent). Recess is slightly longer than games that you might use in a team building program but the concept bears comparison. Based on the results quotes from these reports, inclusion of movement in your training programs will improve the participants’ ability to learn your program. Preparation for any job can be the most important part of the job. Are you ready? Here are 8 questions for you to consider as part of your preparation. What do you want this team to accomplish? You need to be clear about what you want the new team to accomplish before you start the process. You don’t need to know the specifics but you need to know the general objectives. For example if this is to be a SRC team then you need to know if there are specific tasks that the school executive and/or student body want them to achieve this year over and above the general goal of student governance and all that entails in your context. Along the way the team will also achieve other goals. These will be determined during the life of the team and can not be foreseen at the beginning. You can only prepare for the known not the unknown. What skills will they need to accomplish this? Once you know the general goals to be achieved then you need to consider the skills that the team will need to be able to accomplish these goals. Some of these will be the skills that any team will need. Others will be skills specific to the jobs this team is expected to accomplish. Some of these skills may not be needed in the initial team training. They may suit an on the job training model or point of need training. It would be helpful if you could divide the skills into those needed now and those needed later. This will make your planning for the initial training easier to organise. What roles will team members play? The answer to this question is directly related to the type of team you are developing. Different teams will require different roles. Once determined, you will need a set of role descriptions that are easy to understand. These should include the potential extra skills required to effectively function in these roles. In addition, some teams have a hierarchical structure but many have a horizontal structure. If the team is hierarchical, then everyone has a base set of skills but each level of the hierarchy will require extra skills. Even in horizontally structured teams there may be specialised roles – for example the communication sub group may need further skills in using the specific websites for the team. What cultural factors will impact on the team? You cannot completely prepare for which cultural factors will impact on the team life. You should have an understanding of the main cultural impacts in your community. You will also know the composition of the body from which your potential team will be selected. The first factors you should consider will be the possible cultural factors that may impinge on the team training. One example would be: girls from traditional Eastern European families will not be allowed to stay late after school or go on overnight excursions. Another example may be language. If the population from which the team members will be selected contains a high percentage of new migrants from non English speaking backgrounds then the possibility will be high that the depth of understanding written and spoken language will be a consideration. What barriers may exist to full participation by disabled members? Most venues for community meeting are now being made more accessible for all. You cannot be fully prepared for bars to participation until you know the nature of any disability that a team member has. Even then, you will have no way of knowing about any injuries that may occur that result in temporary disability. Once the team members are selected then you will be able to determine what barriers exist for the long term participation of each member in the team activities. You can then work towards minimising them. You will also be able to plan activities that are inclusive for all. What information needs to be available to potential team members? This is one of the most important steps in your preparation. The membership of the team will determine the possible effectiveness and/or success of the team. You need potential team members to have as much information as possible about both the goals of the team and their possible role. When equipped with this information, each potential team member will be able to make as informed a decision as is possible for their maturity about whether they want to be part of the team. Another consideration is how to present the information. You want potential team members to know what they are becoming involved in but you don’t want to scare away potential effective team members. You may need to provide some personal counselling with candidates you feel would make excellent team members. What method will be used to select team members? There is a tendency when team members are younger for the adults to select them. This is the process used in many businesses also where managers select teams. This could be an effective procedure for some teams. But there are other methods that can be used. In some cases such as peer support, the selection process may be volunteers from a particular pool of students. Another example for teams such as the SRC there would need to be some form of representative selection. Whatever selection process is used in your situation it is important to ensure that it works. You may find recommendations for change in last year’s evaluation. This is the time when you can examine the procedures currently in use and determine if changes would improve it. What games would be most in tune with your goals? Once you know the answers to all of the above questions, then you can work through the selection of games and choose ones that meet your unique needs. Each game should come with a set of aims or objectives. You can select those games that best suit your aims for skills development. You can also examine the procedures for the games and determine full participation of all is possible based on your cultural and potential physical impairments. This is when you can make variations to steps to provide total inclusion. You don’t want any team member sitting on the sidelines.